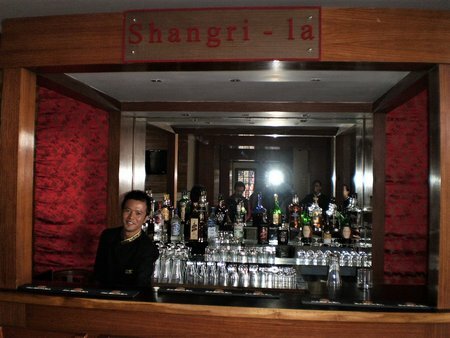 Shangri-La restaurant is part of the Shangri-La Hotel located on Nehru Road and just steps away from the Chowrasta Mall. This is an old heritage building and the gorgeous restaurant is located at the ground floor. The restaurant specializes in Indian, Chinese and Tibetan food and have two chefs who prepare the dishes using locally procured fresh herbs and ingredients. As you enter through the green glass door, there is an impressive lounge area and a small reception counter. The restaurant is just behind that. The restaurant has been recently renovated. 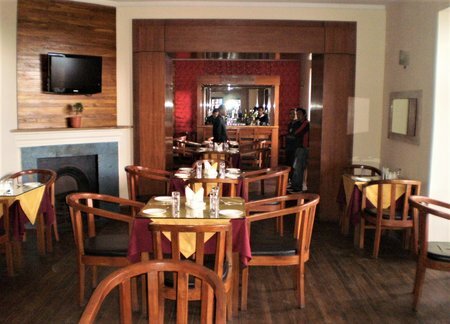 As you walk in, the first impression is that it provides a semi formal but relaxed ambience in a well decorated dining room that is mostly wood finished. The floor is completely wooden and the walls too have wood paneling. There are two sections in the restaurant that are separated by a square wooden arch. The second section at the end is the bar area. You can of course choose to dine wherever you like to. You will see plants kept at the corners and hand painted thankas hung up in the walls. There are large LCD televisions fixed on the walls of both the sections. On the right side, the tables are laid along the windows that open out to the Nehru Road. There are also fire places that are put to use during the winter. The menu is impressive and looks like a booklet. In Indian vegetarian dishes there are lots of items. Some of the great ones are mushroom and baby corn butter masala, capsigum babycorn, tomato capsigum etc. There are different kinds of dal items (pulses) including mughlai dal, dal kashmiri, dal makhni and dal fry. There are wide varieties of chicken items including curry, do payaza (prepared with whole onions), bartha (shredded chicken with gravy and eggs), kasha, korma, tikka masala, makhani, chicken butter masala and more. There is a good news for Bengalis who often flock to this hill town. Shangri-la also prepares the favorite Bengali fish curry. They also have other fish items including fries, masala and kalia. My favorite out of the North Indian dishes is the Lamb kadai which is a good portion of boneless pieces of lamb prepared with curd & herbs and served in a kadai. In Indian, the Tandoor items (made in earthen oven) are probably the best here. Tandoori chicken and chicken shikh kababs are all time favorites. In Chinese start with the chicken munchow soup. There are chowmeins, fried rice and chopsueys both in veg and non veg. Some of the great main courses in veg includes stir fried green vegetables, veg ball hot garlic, veg manchurian or the baby corn, spinach, broccoli in Hong Kong style. In non-veg try out prawn or chicken in oyster sauce, or the Singapore chili prawns, chili chicken boneless, sezwan chicken or garlic chicken. In Tibetan, the momos (steamed dumplings) having pork fillings and served with chicken broth is really nice. The bar at the end is well stocked and has nice selections of both Indian and imported wine, beer and spirits. I found the staff quite friendly and most are good in English. The service was quite good as well and unlike in most of the other restaurants, the well dressed waiters behaved very professionally. Overall a very good restaurant. The restaurant serves lunch & dinner. They accept credit cards. Shangri-La Restaurant is a partner of Darjeeling Tourism Card & offers attractive discounts to card holders on food and bar items. Shangri-la is located on Nehru Road and yards away from the Chowrasta Mall.